The Reservations module will quickly become one of the most important tools in your company. The module serves to reserve shared assets in a company, like a car, meeting room and more. What is the use of the Reservations module? Monitoring of the usage of shared corporate assets, e.g. cars, meeting rooms etc. Reserve a meeting room, car or a projector within seconds. Thanks to the Reservations module, you will never have to deal with quarrels about shared property of your company, and you will always know, that you have all the necessary items for your meeting with a client. Reservation itself is done through the system by filling in a form. Reservations will quickly become one of the most important parts of the corporate social network. Upon the implementation of this module, you will set the LOV (list of values) with specific items which could be reserved. Then, all your employees will be able to reserve listed items for a future use. The Reservations module displays all reservations made within your company. To display them, three different layouts are available – tabular, weekly or monthly listing. 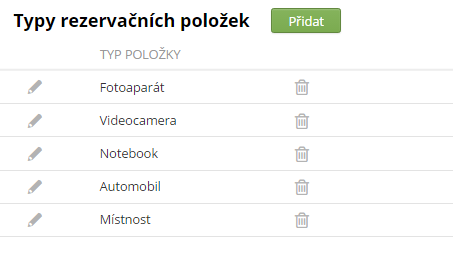 Thanks to that, you will have overview over who reserved which item and who uses the item the most. Those using the company’s shared items the most surely need an overview of reservations. The eBRÁNA system is ready for that. Simply add a Reservations widget to your dashboard and you will always have overview of items which are free for use. Consultations are free of charge. Really! We will discuss your project with you for free. Fill the from in or call us, its up to you. What would you like to use the system for? Check the price list for the price of the Reservations module.